Parking lots are a part of everyday experience for most people in Shoreline, WA. We drive our cars to work, school, shopping, run errands during the weekdays and on the weekends, we seek amusement at theaters, malls and parks. Mostly we take parking lots for granted until something happens that makes parking our vehicle time consuming or poses safety risks. Driving into a fatigued asphalt parking lot with worn barely visible pavement markings makes it harder to navigate and less safe to travel within on foot. Most property owners desire a parking lot designed to retain the maximum number of parking spaces yet still functions with pedestrian safety concerns as a priority and to be affordably priced. Seattle WA Paving will help you retain a maximum number of spaces in tandem with pedestrian safety and keep clients from moving on to competitors. We stay updated on current parking lot regulations and can advise you how to plan for them. We also install the concrete portions of the commercial parking lot, such as sidewalks, curbs, speed bumps and storm drains or culverts. No need to coordinate with another company- we own all of the equipment necessary to build a parking lot. Also, our equipment, we have thousands invested, undergoes routine maintenance. No worries over our equipment breaking down and destroying your schedule. All of us have driven in parking lots we hate. Some have too narrow parking spaces that make it difficult to park, especially when squeezing in-between 2 large SUV’s (when its the only space left). It gets really bad if someone parks over the line, because subsequent parking is all messed up. One gets the impression the business just wanted to squeeze in the maximum number of parking spots rather then worry about the maneuverability of their parking lot. And, if you ever had to maneuver into an angled parking spot from the wrong direction, then you know how frustrating some lots can be. Some drivers especially seniors will avoid badly designed parking lots, and look for competitors with more comfortable parking because women in high heels and seniors worry about falling. There are lawyers titled "Slip and Fall". They cover personal injury lawsuits against parking lot owners that have confusing signage or maintenance issues that have not been taken care of. A good parking lot provides a clear easy pathway to a parking spot. A parking lot without a lot of shrubs and bushes is best for an unobstructed view that shows in a glance all of the parking spaces is best. The safer parking lot plans put the parking spaces parallel to the buildings entrance. Thus, any drivers mistaking the gas pedal for the break won’t hit the building. Bollard’s (those big red cement balls outside of Target) could also be placed at building entry points to stop run away cars from causing harm. Designing a parking lot for a new building is sometimes more of an afterthought than forethought and it’s a scramble to make an inadequate parking lot adequate to meet the grand opening deadline. The parking lot may not be large enough for the traffic anticipated, incorrect number of required handicap spaces, security lights and cameras do not reach the boarders, and the wheel stops (when placed poorly) could be more of a trip and fall hazard than a good control feature. 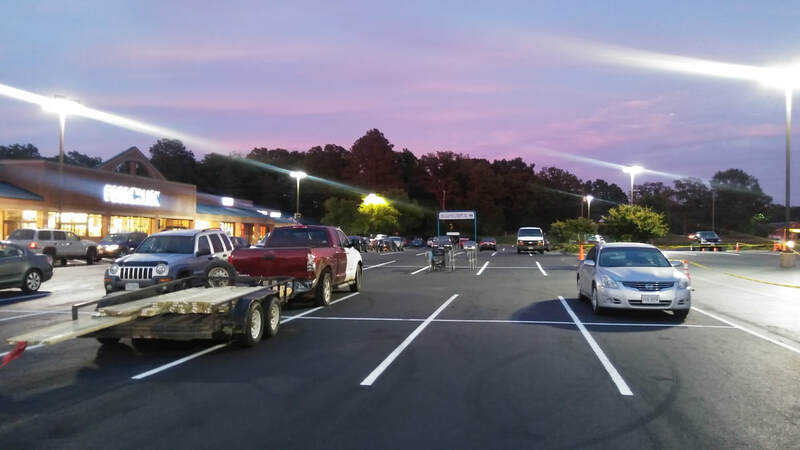 When you hire a skilled contractor to work with your architect from the beginning, regulation errors or other problems with the design of the parking lot are less likely. 3 complementary onsite parking lot assessments is the best way to determine market rate costs for the new construction. Most honest companies will likely have the same expenses so if one of the quotes is more than 25% lower or higher time to question why. Most companies expect clients to get several estimates so to stay competitive they need to keep track of competitors and market fluctuation of oil. Asphalt is a byproduct of oil refinement. Many products are produced when crude oil is distilled, some are gas, gasoline, kerosene and asphalt (bitumen). If you have a low ball offer the contractor may not carry insurance, may use day laborers, may be using substandard materials (lower grades of asphalt mix), or could be newbie bidding for a job beyond his capabilities. ​Water is perhaps the most destructive force in nature and it can also destroy a parking lot very quickly. If water is not directed away from the parking lot to a drainage retention pond or managed waste water, it will either cause standing water on the parking lot or seep underneath the parking lot into the subbase. When water settles on the parking lot surface, it will dissolve the binder or glue holding the asphalt together- leaving what amounts to rocks in it's wake. Water that seeps into the subbase of the pavement will erode the stable strength of the pavement shelf above quickly causing cracking then collapsing into potholes. ​Block Cracking shows up as large oblong shapes connected by cracks. They are caused by an asphalt mix that was too dry, not enough binder or the asphalt was too cold. Block cracking can be repaired with a thin overlay. ​Raveling is when the asphalt binder separates from the fine aggregate (sand, gravel and crushed stone) causing pitting from the surface going down or from the edges inward. Most often the result of inadequate compaction during construction or cold weather paving (hardening substance does not compact well). Fix calls for removal of the raveled pavement and then overlay. Resurfacing asphalt parking lot is taking the top layer of old or damaged pavement off and replacing it with a newly compacted. 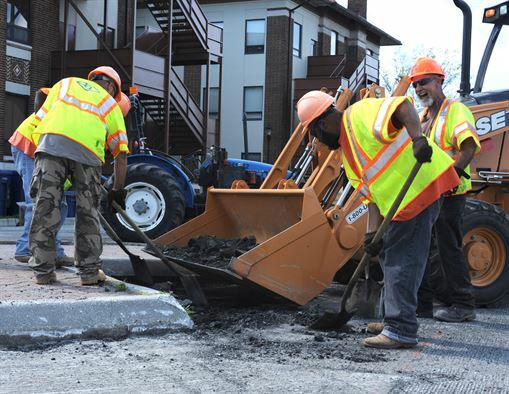 This is done with a series of small rotating blades that will grind 1.5 to 2 inches of the original pavement up, placing the crumbles into a dump truck, cleaning the surface, adding a tack coat and putting down another surface layer of asphalt. After the pavement has cooled, then it can be restriped. It is very appealing as a fix for renewing large parking lots because the costs are less than a full reconstruction, long lifespan of 8 to 10 years and the time needed for installation is fairly fast. However, it can’t be done with a badly damaged subbase because the base supports the upper surface levels and its inadequate support will again cause damage to the surface. ​Sealcoating seals small cracks and protects the asphalt pavement from weather, rain, UV rays, reduces exposure to oxygen and will resist salt and chemical penetration. Reducing the effects of weathering keeps the moisture from infiltrating the subbase to cause extreme cracking or worse potholes. Applying a sealcoat every 2 to 3 years has been shown to double the lifespan of your parking lot. Sealcoating will provide a deep black finish to the surface that will provide excellent contrast between the pavement and striping. Prior to sealcoating, the parking lot should be cleaned with a sweeper truck, blowers and brooms to remove all dirt and debris. If cleaning is not done prior to sealcoating, the bonding will be weak between the pavement surface and the sealcoating could slide right off. Sealcoating preserves asphalt pavement for pennies per square foot, versus the costlier asphalt patch repairs or resurfacing. As a concrete and asphalt pavement contractor (Seattle WA Paving), has an advantage over competitors because we not only install the asphalt parking lot but install all concrete forms needed for the asphalt parking lot. For example, we build concrete curbs on the boarders of the asphalt parking lot to protect the weaker asphalt edges from crumbling. Curbs that frame asphalt pavement also improve compaction because the asphalt pavement is confined to a limited space with strong boarders that will push back as its compacted. We also build wheel stops, speed bumps, drainage ditches, sidewalks, and reinforced concrete pads for garbage dumpsters. Concrete pads laid in front of dumpsters or loading docks will strengthen the load capacity of the pavement that regularly receives heavy loads. Thus, stress fractures on these pads traveling into the asphalt parking lot will be less likely. Dealing with one contractor for a parking lot project means no worries over scheduling conflicts. Plus, by hiring one contractor instead of 2 you're bound to get a more attractive price. Since the contractor is already onsite for the next phase of the project, no set up and travel time to a separate site is necessary. Experience with and understanding the strengths and weakness of both the asphalt pavement and the concrete curbing elements that come together to make a parking lot helps reduce or eliminate crossover installations errors- this is a strength that Seattle WA Paving can offer commercial clients. ​When you contact Seattle WA Paving, all you’ll hear from us is “WE CAN HANDLE THAT”. 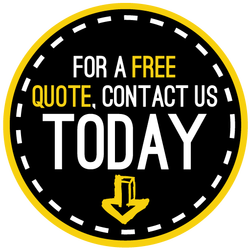 Give us a call, text or fill out the quote form, at the top right-hand corner of the page, and give us a chance to provide a written detailed project quote. Keep in mind that we are license, insured and bonded in the State of WA. We do not hire day laborers; all our employees are full time.